Molly Jacobson '17 is spending the summer as the piping plover intern at the Rachel Carson Wildlife Refuge. By Molly Jacobson’s estimation, she’s been pooped on many times. It’s just, she says, another day at the office. Jacobson '17, who graduated from UNH's College of Life Sciences and Agriculture with a degree in wildlife and conservation biology, is spending the summer as the piping plover intern at the Rachel Carson National Wildlife Refuge in Wells, Maine. Every year from April to about August, these small, sand-colored shorebirds arrive on Maine’s southern beaches to nest in the dune grass, breed and raise their young. The Atlantic population of piping plovers is on the federal government’s endangered species list, where they are listed as globally threatened but endangered in a number of U.S. states including Maine. Habitat loss and degradation due to coastline erosion and development, human interference and predation are the main causes. “This year, we’re having a big issue with a great horned owl that lives near the marsh,” Jacobson says with a sigh. 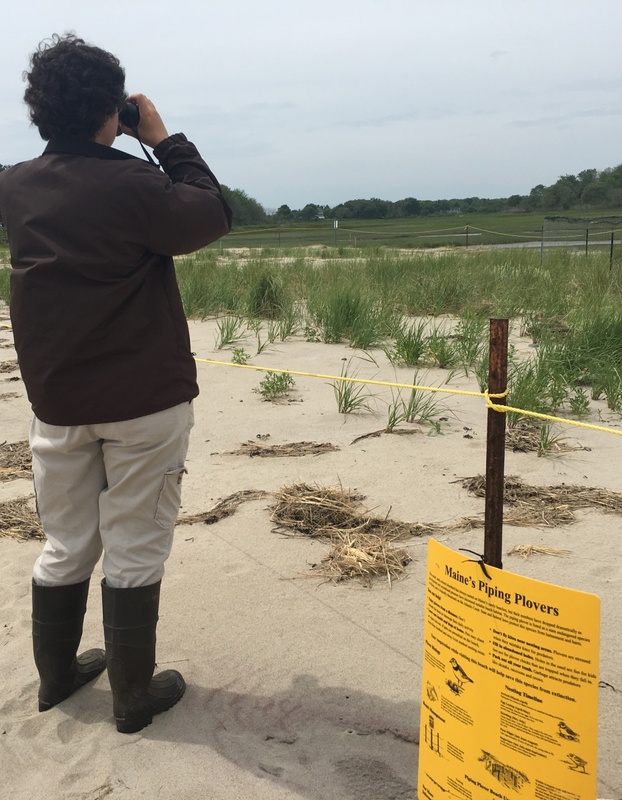 Along with her piping plover monitoring, she’s also keeping an eye on Maine’s threatened least tern population, doing a bit of invasive species management, surveying pollinators and educating the public. Soon she’ll be working on the International Shorebird Survey. Jacobson’s typical workday begins with a trip to the beach to look for evidence of nests, and if there are people around, she asks them to be respectful of the birds’ nesting areas. Following the beach work, she spends time at a few of the refuge’s properties, photographing bees and setting traps for pollinator surveying. Come dusk, she’s back on the beach checking for predators, counting birds and making sure chicks are safe. She says these patrols are especially important during the chicks’ first eight days of life, when they are most vulnerable. And while she wants predators to know she’s around, she’s careful not to upset the birds. When her internship at the refuge ends later this summer, Jacobson’s plans include a few more seasonal positions, then graduate school in entomology — her true passion. During her junior year, she began studying native bee pollinators at the UNH Bee Lab as a part of a Summer Undergraduate Research Fellowship. The lab, which is run by her mentor, assistant professor of biology Sandra Rehan, has 150 years worth of bee records and more than 21,000 specimens from across the state of New Hampshire — a veritable goldmine of data for a researcher. “I worked on a bee biodiversity project, and my senior thesis focused on bumblebee declines, which provided a lot of new insight into where we need to direct our conservation efforts in New Hampshire,” she says. Jacobson’s typical workday begins with a trip to the beach. Jacobson says she’s grateful for the research and fieldwork she was able to conduct as an undergrad at UNH and for the guidance and support she received from faculty like Rehan, Don Chandler and Thomas Lee, her academic advisor. Looking ahead, she says she’s confident and prepared to pursue her goals. Jacobson's undergraduate research was funded and supported by the NH Agricultural Experiment Station and the UNH Hamel Center for Undergraduate Research. COLSA faculty Sandra Rehan, Don Chandler and Tom Lee conduct research using NHAES funding. Interested in working to protect endangered species? Learn more about UNH's wildlife and conservation biology program.